Alexandria Ocasio Cortez, aka Occasional Cortex, revealed an energy and social justice plan today called The Green New Deal, promising a massive transformation of American society. However, the substance (full pdf below) is so ridiculous, there are many people now wondering if she and her allies were set-up by political opponents to make themselves look like fools. This story blows my mind. This girl is going to have a HUGE fall soon enough. But we'd be better off to let the Dems. vote for her crap ..... first. You go girl! I haven’t laughed this much since election night 2016. The lunatic Latina does not exist in a political vacuum. A significant percentage of the American population is ignorant, decadent, hedonistic and daff. She has a constituency. By destroying jobs through socialism? Yeah that’s brilliant. "By the end of the Green New Deal resolution (and accompanying fact sheet) I was laughing so hard I nearly cried. If a bunch of GOPers plotted to forge a fake Democratic bill showing how bonkers the party is, they could not have done a better job. It is beautiful." The Lame Street Media appears to have made Occasional Consciousness the darling of the Democratic party and they bought into it. Translation: Allow criminal foreign invaders to keep breaking immigration laws. I have heard of daft, and deaf, and deft, but never ever have I seen the word “daff” until today, and I have now seen it twice. 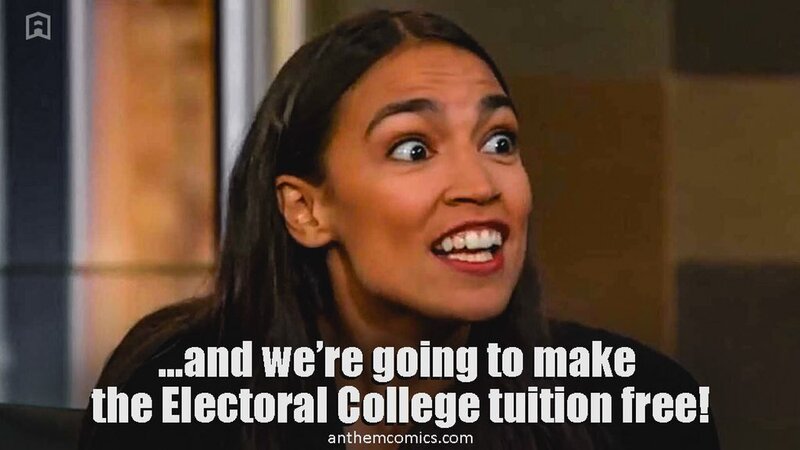 AOC is the voice and face of the Democrat party, and we must take every opportunity to expose her idiocy so that there is no question that AOC and the Democrat party are one in the same. Our hope is that there are enough independents who will see the Democrat party for the disaster it is, and will vote accordingly. That girl is amusing ...... until one really thinks of just how deeply ignorant many of our citizens really are. I think (hope) there are some Dems with the smarts to warehouse her someplace out of sight like Patty Murray from WA. She’s an embarrassment, now they have two. LBJ tried that and as a result created a welfare-dependent permanent underclass. "The lunatic Latina does not exist in a political vacuum. A significant percentage of the American population is ignorant, decadent, hedonistic and daff. She has a constituency." You're right ..... and what you say is very frightening. The substance is not important. Of course it is a recipe for disaster. The danger comes from attending to the proposals as if they are deserving of argument. Remember the Leftwing rule: the issue is never the issue. The hazard inherent in this roll out is the media treating it as if it is a bona fide proposal. The worst thing that can happen is that even by posing as skeptics they provide oxygen and give the monster life. And the monster is not laws against cow farts, the monster is a totalitarian police state.